Had a low point Weight Watchers dinner last night that I wanted to share with you. 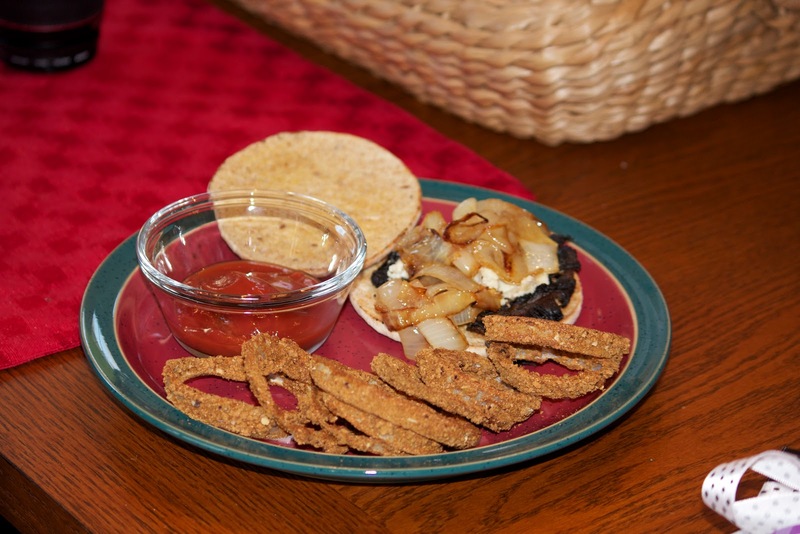 The Portabella Burger recipe is my own, the onion rings adapted from The Hungry Girl. Spray skillet with Pam and saute onions until golden brown and soft. Heat grill to medium hot heat. Clean mushrooms, spray with Pam and sprinkle with steak seasoning. Grill until hot. Spread 1 triangle of cheese onto each mushroom. Spray rounds with Pam, toast on grill. Lay mushroom on bottom round and cover mushroom with grilled onions. Top with the remaining round. Makes two sandwiches at 4 Points Plus each. Preheat oven to 375. Spray cookie sheet with Pam. Mix ranch dressing with cereal and pour into a plate. 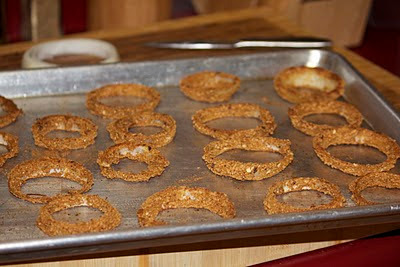 Dip onion rings into the eggbeaters, then into the crumbs. Place rings on cookie sheet but do not stack. Bake in oven for 25 minutes, turning once half way through the baking. Onions should be soft inside and crunchy on the outside. We loved this meal and will try the "burgers" with bleu cheese and balsamic vinegar next time! The variations are endless! Not sure about the burgers, but those onion rings look wonderful. John and I are on a little weight-loss program (Dr. Phil's) and I love finding things that don't make us feel so deprived. On my...these recipes looks awesome....I just saved them in my "recipes" folder! WW sure has much better recipes than when I was in the program years ago! I love portabella burgers! These look so delicious.